Striker David Ajiboye netted four minutes from time as Worthing booked a spot in the second round of the Velocity Trophy last night. Ajiboye's late effort - his sixth goal in seven matches for the club - was enough to see Worthing to a 1-0 first round triumph over Bostik League Premier Division rivals Leatherhead at Fetcham Grove. Worthing came in to it on the back of an FA Cup first round qualifying win over league below Faversham Town and made it seven games without defeat in all competitions to start this season after overcoming Tanners. Adam Hinshelwood made four changes from the team that saw off Faversham in the FA Cup with Joe Clarke, Rhyle Ovenden, Oliver Pearce and Ricky Aguiar coming in for Darren Budd, Sam Rents, Callum Kealy and the injured Jared Rance. Midfielder Ross Edwards was forced off after 15 minutes, replaced by defender Will Miles, in what was an otherwise quiet first period. Extra-time was looming when in-form frontman Ajiboye got the decisive goal on 86 minutes. 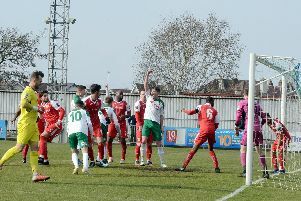 The ex-Brighton striker got his sixth goal since sealing a summer switch as Worthing reached round two. Worthing welcome Margate in the league on Saturday then travel to Potters Bar Town on Tuesday. WORTHING: Covolan; Colbran, Racine, Crane; Edwards, Ovenden, Clarke, Starkey; Ajiboye, Aguiar; Pearce. Subs: Miles (Edwards), Skerry (Pearce), Pattenden, Budd, Cocoracchio.